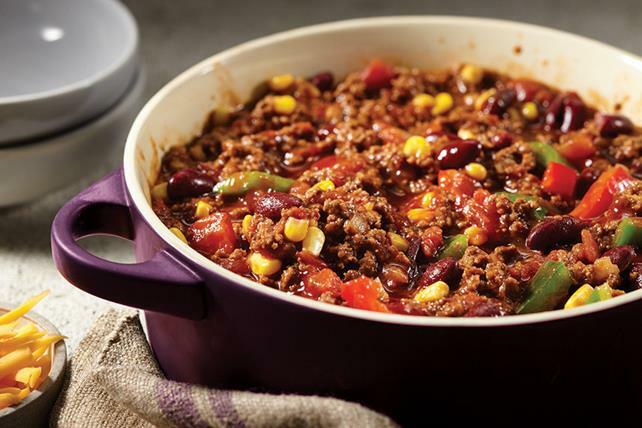 The smoky barbecue sauce adds the perfect accent of flavour to this hearty chili. Heat oil in Dutch oven or large saucepan on medium heat. Add onions, bell peppers and garlic; stir. Cook 3 to 5 min. or until vegetables are beginning to soften, stirring frequently. Add meat; cook 10 min. or until evenly browned, stirring occasionally. Stir in dry seasonings. Add tomatoes, barbecue sauce and tomato paste; mix well. Bring to boil; simmer on medium-low heat 40 min., stirring occasionally. Stir in beans and corn; cook 5 min. or until heated through, stirring occasionally. Remove from heat; top with cheese. Serve with crusty whole wheat bread. Serve chili topped with sour cream or guacamole instead of the cheddar. Looking for a meatless chili recipe? Try our Diana Smokehouse Vegetarian Chili recipe instead.